I can’t help but be struck by the differences in approach we each have to what is called “The Dharma.” While at root the Dharma is one inviolable truth, just like the law of gravity is one law for all of us, the views of it can be as different as there are people in the world, innumerable filters obscuring or interpreting the same essential reality. However, unlike the law of gravity, to which we as individuals tend to respond similarly, the dharma is much more than just the physics. It also includes psychology and whatever passes for spirituality for each of us, and who knows what else. I find it helpful to keep in mind that my particular “dharma” will be whatever method or path it will take for me personally to realize the true nature of the mind and go on from there to enlightenment. I imagine these personal dharma-paths are as individually different as we as people are. And yet, at heart, like the law of gravity, we all have Buddha Nature in common. In other words, while we each have everything within us that Buddha had to enlighten himself, our particular personal path to enlightenment will vary, thus the 84,000 dharmas or paths that are said to exist.. However, I believe we are mistaken if we assume that we will just happen upon our particular dharma path. This idea of waiting to be enlightened, you know, assuming that one day Prince Dharma will come along and rescue us does not seem to be true. Of course eventually something may happen one day, but probably not just by our waiting. We might have to do something to deserve it. If there is one message from the Buddha that I did not get for a very long time, it is that enlightenment is very much a do-it-yourself project. It doesn’t just passively happen to us by accident. We have to help make it happen, as in enlighten ourselves step-by-step, just as the Buddha did. Otherwise we will, as the teachings point out, continue to wait for innumerable lives, as we have been -- forever if need be. When I talk to myself about this, I call it the “Go to meet your maker” issue, as in: we must ourselves make an effort, go at least halfway. The point is that the Buddha laid out a very clear path (The Dharma) to enlightenment that we can follow, but at some point we have to follow it, to actually do it, and do it all by ourselves. Fallowness is not a virtue here. And, obviously, ignorance of the dharma is no excuse. In fact, the teachings bend over backward to point out that, of the traditional three main poisons (attachment, aversion, and ignorance), ignorance is the root poison – the main one. From ignorance (habitually ignoring the true nature of our mind), attachment and aversion are said to arise. My point here is that ignorance is certainly not bliss; just the opposite. It is what the Buddhists call “Samsara.” If we ignore the law of gravity, it is at our own peril. Unfortunately, this it also true of the laws of dharma, their being for all practical purposes the same as nature’s laws. As the great siddha Chögyam Trungpa pointed out as a definition of non-theism, no one will ever rescue us from on high. No one exists to do that for us. We have to personally turn the wheel of our own dharma just as the Buddha did. Otherwise it will just sit there, unturned – unmoved. In other words, Buddhism is, above all, proactive, a DIY project. And while Buddha Nature (and the Dharma) may be the absolute truth for each of us, relatively, our truths (the way we individually see the truth of the Dharma) differ as much as we do from one another in thought, word, and deed, and that can be a lot. While the dharma is absolutely the one bright light for each of us, relatively we each are right now feeling our way along through the darkness of our various filters or personal obscurations like a blind person. So there ARE differences that matter. Buddha discovered the Dharma for himself through the help of his teachers and was compassionate enough to share his method with us. It is the same “Dharma” that all previous Buddhas have found, the method to complete enlightenment. And while today for most people the Buddha and The Dharma are mostly synonymous terms, there is (or used to be) a difference. For each of us, that difference still very much is a fact, because we have not yet found our particular dharma to the point of becoming fully enlightened. We have yet to become our own Buddha and do what he did, enlighten ourselves, so the differences between Buddha, the Dharma, and enlightenment are for us very much to the point. Something that I perhaps want to discuss in more detail is what is called “The Lama of Appearances,” a Buddhist teaching (that I did not know existed) that points out that Mother Nature is a perfect reflection of the dharma and can be just as perfect a teacher as what Buddhists call “The Lama of the Lineage” that we are all aware of. 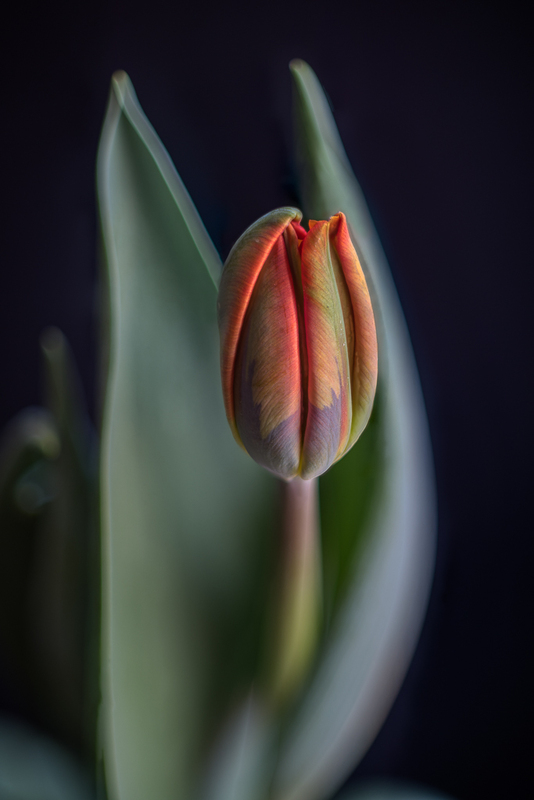 In other words, this image of a tulip bud I that took yesterday, in its own way, is just as dharmically profound in what it points at as the dharma images (Buddha, Gampopa) I have been posting in my last several blogs. Any comments about that thought?